In Forbidden Psychology 101, you’ll learn the forbidden, secret psychological techniques that will turn your life upside down, and there won’t be any obstacles preventing you from gaining the respect and freedom you want and deserve. Do you struggle to get your point across to people? Do you ever feel like you are somehow weak and ineffectual in the way you communicate? Perhaps others just don't take you seriously. There is no easy fix for all of your problems. However, whatever those problems are, if social interaction is involved then a firm grip on the tenets of nonverbal communication can make it better. Your mother wasn't just blowing hot air when she told you to stand up straight. Mom knows the way we carry ourselves says a great deal about our character, our self-respect, and who we are. Psychology is the fascinating study of the human mind's inner workings. Understanding psychology lets you understand people. You can use an understanding of people to make human interaction and life in general easier. But there is a dark side to psychology. A side that people do not speak about in polite society. A side that is explicitly forbidden by ethical committees and such supervising agencies as the UN and the Geneva Convention. This is forbidden psychology. Forbidden psychology includes manipulation, mind control, brainwashing, emotional and mental abuse, deception, torture, and seduction. It is the process of using your understanding of the human mind to get your way and cause harm. Forbidden psychology is not always nice. But life is not always nice, either. An understanding of forbidden psychology enables you to take control of your life by controlling others who stand in your way. 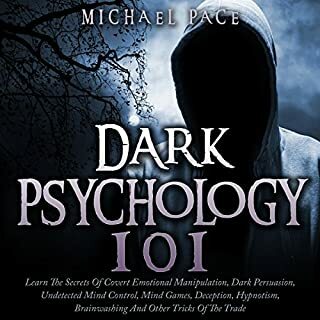 It also enables you to understand the harmful dark psychology that other people use on you, so that you can take measures to protect yourself. 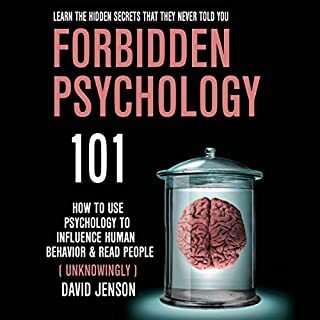 No matter why you are interested in forbidden psychology, this book is your ultimate guide to forbidden psychology topics. This book is filled with the mesmerizing and forbidden world of mind control and manipulation. 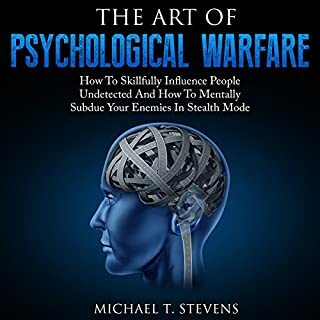 You will learn about everything from how to lie effectively to how to interrogate people for the truth, from subliminal advertising to torturing prisoners of war, from seducing someone to brainwashing. How you use this information is up to you. But certainly forbidden psychology is a fascinating subject that anyone can benefit from knowing. 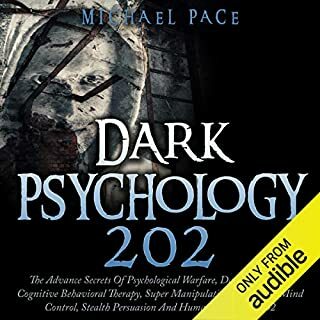 Begin your journey into the dark side of psychology today. I didn't have much trouble getting through it, though the subject matter was really dark, low frequency, evil. The presentation was lucid but the material was somewhere between dated and common sense, making the best, so-to-speak, part the old torture methods. Not one I would recommend. It's just a manual from a perspective of insensitivity on how to be the kind of loser we can all spot a mile away and read like a book today. It's repetitive and silly! I found myself laughing out loud and wondering to myself why I'm even listening to the simplistic & nonsensical information being shared. I wasted my time, please spare yourself the painful listen. If you have ever been in an abusive relationship, this book is a MUST read! It's incredibly eye opening. This book was ok, but I don't recommend it. It really just skimmed the surface. no meat and potatoes, just a hint of what's available. I would like to read more of a how to book than an overview. there was not very much information in this book that is not commonly known it was actually a waste of time to listen to it I would not recommend it. What disappointed you about Forbidden Psychology 101? Inaccurate, conspiracy theorist trash, centered around teaching people how to be emotionally destructive in relationships. your enemy will attack you with every restores that thay can use on you. And will do what it takes from you to get there ends.